At least 10 people have been injured in clashes in Kosovo, where police deployed tear gas against activists who vandalized a police station, as protesters demanded the release of a far-right MP arrested after a tear gas incident in parliament last week. Clashes with authorities started after supporters of left-wing organization Vetevendosje smashed windows with stones at the central police station, demanding the release of Albin Kurti, the founder of the opposition's Self-Determination party. 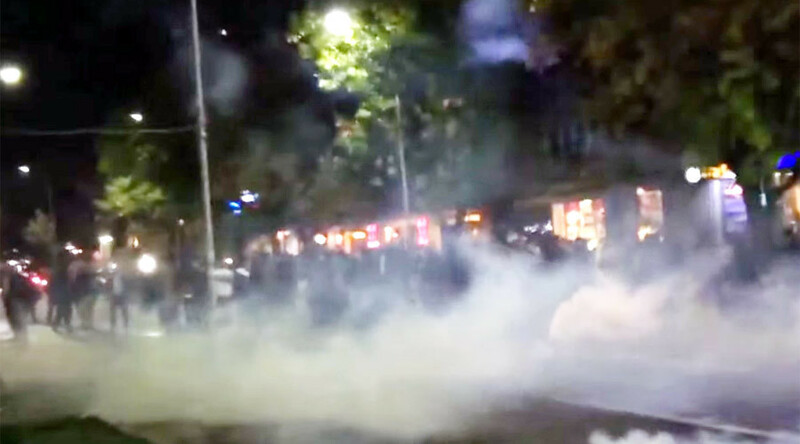 In response, police deployed tear gas against some 200 protesters, Radio and Television Serbia reported. Protests paralyzed the city as participants set several cars on fire and reportedly attacked the headquarter of the Democratic Party of Kosovo, run by Hashim Thaci. The clashes injured three protesters and seven police officers, police spokesman Baki Kelani told AFP. In order to avoid further clashes, Pristina's police have released Kurti, after having held the MP in custody since Thursday. The founder of the opposition party was arrested last week after he opened a tear gas canister inside parliament in protest against the government's plan to grant more powers to Kosovo's Serb population. "I call on you not to stop until we prevent the creation of the 'community,'" he said, after his release from detention, in reference to a deal between Belgrade and Pristina that established Serbian-majority municipalities in Kosovo. Appearing outside parliament to address supporters, he accusing police of "being in the service of daily politics." Ninety percent of Kosovo's 1.8 million people are ethnic Albanians. Ever since Kosovo's self-proclaimed independence in 2008, Kurti has remained a leading opposition figure against Pristina's dialogue with Belgrade. He has been most vocal about the accord in which Kosovo agreed to give more financial and legislative rights to the Serbian community.